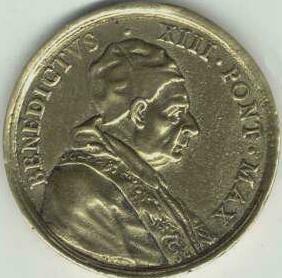 Bust of the pope, r., wearing camauro, mozzetta and stole. 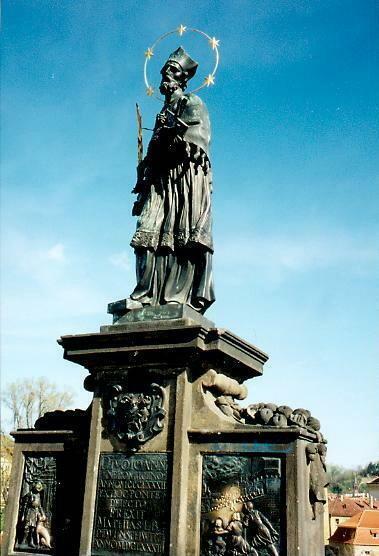 "To Charles the Great, Defender of the Roman Church. 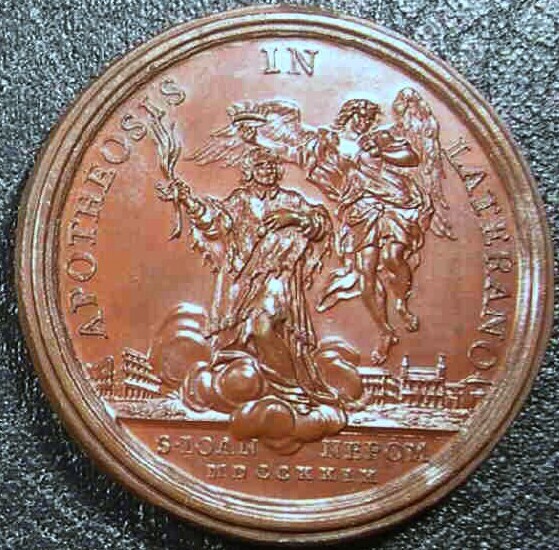 In the Jubilee Year 1725." 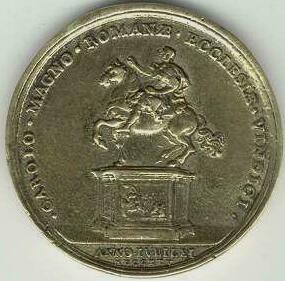 Equestrian statue of Charlemagne on a decorated base. 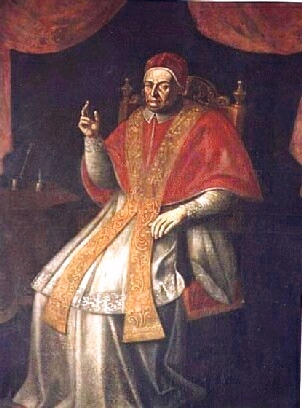 The statue, by A. Cornacchini (1685-1740), is in the south end of the Portico of S. Peter's Basilica, Rome. 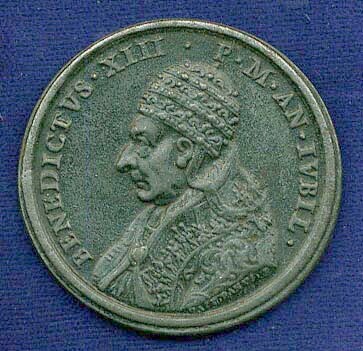 Bust of the pope, l., wearing Papal Tiara and cope. 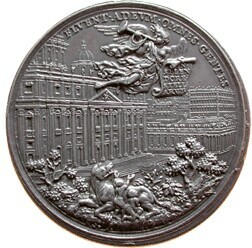 St. Peter's Basilica and the Vatican Apostolic Palace. In the foreground, Romulus and Remus being nursed by the wolf, amid the bushes. In the sky, an angel bearing a scroll and blowing a trumpet. 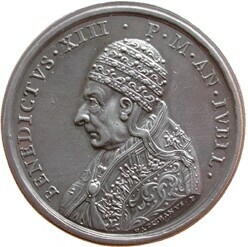 Bust of the pope, l., wearing tiara and cope. 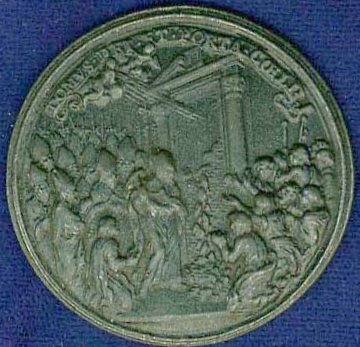 The Pope and the papal court at the opening of the Holy Door, Christmas, 1724. St. Dominic on clouds, ascending into heaven, accompanied by angels, a book (Gospels) under his left hand; the surface of the earth below. 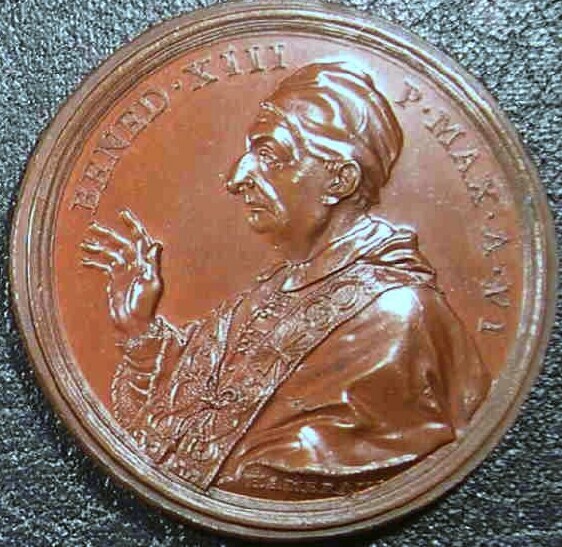 • BENED • XIII | P • MAX • A • VI	• Bust of the pope, l., wearing camauro, mozzetta and stole, his right hand raised in blessing. 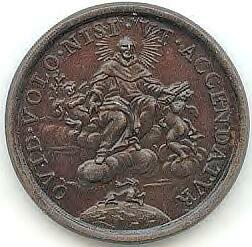 St. John Nepomucene on clouds, with a martyr's palm in hsi right hand, ascending into heaven, being crowned by an angel. On the left, the Scala Santa; on the right, the Lateran Palace, the loggia of benediction of the Lateran Basilica, and the Lateran Baptistery. 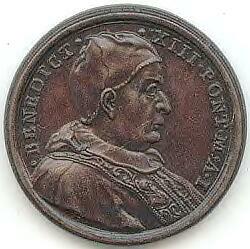 Pope Benedict XIII canonized St. John Nepomuk on May 19, 1729, in the Lateran Basilica. from the bridge to his death.